New Langley Federal Credit Union branch at 7420 Granby St.
Langley Federal Credit Union plans to open its new Wards Corner branch at the corner of Granby Street and Louisiana Drive by the end of March. Of the six full time employees projected to staff the branch, five of those will be new hires, according to LFCU spokesperson Susan Thrash. “We have been looking for a good location in Norfolk and we took advantage of this opportunity. This location will serve current members, and help us grow on the Southside,” said Thrash. LFCU was established in 1936 and has more than 175,000 members and $1.5 billion in assets. sixteen other branches on the Peninsula. The renovation project designer is Guernsey & Tingle Architects, with Glenn Development serving as contractor. The property transaction was brokered by Harvey Lindsey Commercial Real Estate of Norfolk. Bob Batcher, Norfolk’s Public Relations Manager, has asked that we post the link to the Waterside Market Place Survey on our website. Help Norfolk determine the highest and best use for this public space. More than $13 million has been invested in the Greater Wards Corner area since approval of the Comprehensive Plan. Last year, police presence and code enforcement activities were stepped up, surveillance cameras installed in Denby Park, and a neighborhood watch begun with 60 residents participating. As a result, violent crime in Wards Corner dropped 35% and property crime 6%. Three residential rehabilitation programs were begun for Denby Park, Oakdale Farms and Monticello Village to assist residents in upgrading their homes. The programs were so successful that within six months, the first $1 million was committed to 21 homeowners. Another $1 million was committed this fiscal year to assist 40 homeowners, and there’s already a waiting list for next year. On the commercial side, the department of development is in active discussions with major property owners in the heart of the Wards Corner business district, and we expect new development opportunities to be identified later this year. We were disappointed and concerned by last year’s increase in the homicide rate. With that exception, overall violent crime was down 14%. In a very positive sign, juvenile arrests dropped significantly in selective enforcement areas – 83% in Huntersville; 41% in Denby Park and 14% in the Pleasant Avenue corridor. Overall juvenile arrests were down 52%. But the problem is still severe, it affects our children and school safety. That is why I will ask the city council to establish a task force on youth and gang violence to be chaired by the vice mayor, Anthony Burfoot. The City and NRHA continue to acquire dilapidated properties in Ocean View for redevelopment. Recent examples include a 16 unit apartment on First View, a 15 unit apartment in Willoughby and the old Ramada Inn property on Ocean View Avenue. Successful resolution for use of the property along 5th and 7th Bay Streets now makes it possible to begin thinking about preparing a development plan that includes public open space for this very desirable site. The rescheduled Mayor’s Wards Corner Task Force will meet Thursday, February 18th, 8:30 am at the Norfolk Fitness and Wellness Center, 7300 Newport Avenue. 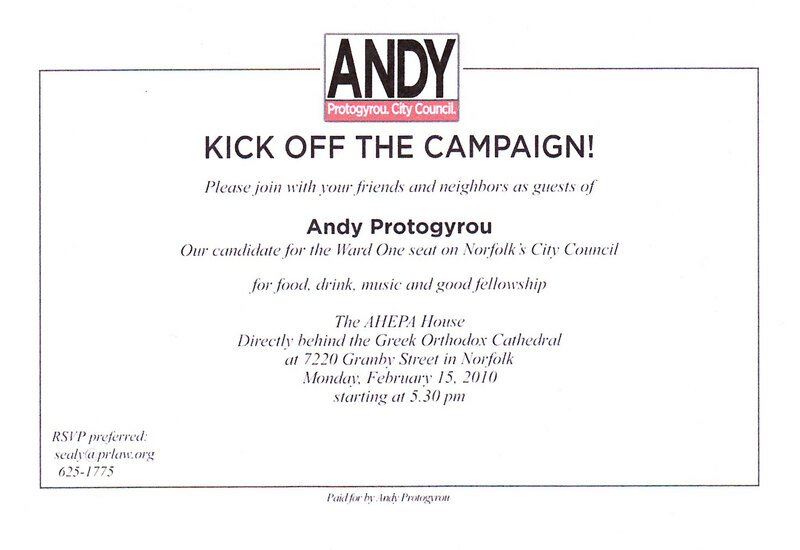 Andy Protogyrou will formally announce his campaign for the Ward One Council seat on Monday, February 15th, 5:30 pm at the AHEPA house behind the Greek Orthodox Cathedral, 7220 Granby Street, Norfolk. All Ward One voters are invited. R.S.V.P 757-625-1775. Good morning. The Greater Wards Corner Task Force meeting scheduled for February 11th has been cancelled. The Greater Wards Corner Task Force meeting has been rescheduled for February 18th 8:30 am at the Norfolk Fitness and Wellness Center. We apologize for any inconvenience. As a courtesy, please notify other task force members of this change. I thank you in advance. Let me add a few word of apology for seeking a reschedule and thank you for allowing it. This is a meeting time which is normally set for me and does not change. It was not a meeting time where the council members are required to attend. Unfortunately I have to attend to another commitment and did not have flexibility to change it. I will work to not let this happen again if at all possible. I appreciate your flexibility. You are currently browsing the Wards Corner Now - Wards Corner, Norfolk, Virginia blog archives for February, 2010.